So this came up for me again this week when I saw that a random food blogger (who had been in touch with me awhile back, suggesting they would like to write about my tapas tours – nudge, nudge, wink, wink) had actually landed a freebie tour with a corporate food tour company here, and were tweeting about them, as promised. And all of me went … ewwwwwwwwwwww. You see, I’ve been getting requests like this for years. And while I know how most restaurants feel about such requests (they hate them with a passion) I wondered how other food tour companies felt. As in… hey, give us a free food tour for “exposure”. The “us” usually includes a friend or partner, since these people tend to be here on holiday, not for work, and think a promise of a blog post means they get to dine out for free. And to be honest, none of the bloggers who have asked for (or insinuated they wanted) a freebie has ever been anyone of consequence. 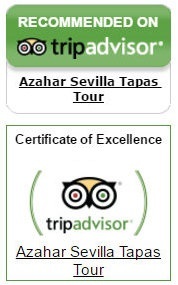 On the other hand, proper journalists always offer to pay for their tours – and rightly so – since they are here in Sevilla at the behest of their employers, and have a budget that allows for this. To wit I have been featured in some pretty top notch publications, including the Sunday Times, Washington Post, National Geographic, Lonely Planet, National Post, Telegraph Travel… to name a few. Other times I end up “meeting” food and wine writers on social media – usually via Twitter or Instagram – and when I find out they will be visiting we will either meet up for a drink and tapa and a chat, or – if they want a full tapas tour – they offer to pay the bills if I would take them around. And you know what? This I don’t mind at all. Because I am already “connected” with these people, even if we haven’t met in person yet, and I want to spend some time with them. And they also respect that this isn’t my hobby. So if I am willing to spend an afternoon or evening taking them out, then at least they are happy to pay for the food and drink so I don’t end up out of pocket. Fair enough. But some other food tour companies here obviously think offering food bloggers freebies is “good for business”. And who knows? Maybe it is. For them. But when I look at these random bloggers, and then I look at the people, serious food and wine writers, who actually respect my work enough to pay for it, I know which camp I’d rather be in. I’ve had people want to get free meals in exchange for a review. Like you I will only do it if I know the person and their ‘reach’. It has to be a fair exchange and it wouldn’t be with most of them – they are just liggers!